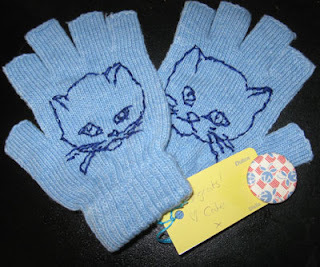 Last week Cate from the wonderful Polka Dot Rabbit had a give away on her blog to win these ace embroidered kitten mittens. I entered it, and won! How nice is that? They arrived today in the mail, with gift card and the cutest little badge out of retro looking material. Such a wonderfully warming package. Thank you again Cate!